This baked acorn squash with Ling Ling Fried Rice recipe post was sponsored by Ling Ling. All opinions expressed in my post are my own. I love the many varieties of winter squash available in the fall, don’t you? Not only are they beautiful to look at in their natural state, they’re easy to cook and surprisingly versatile. 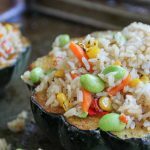 I love using them as part of a dinner entree, and that’s exactly what I did in this recipe for Baked Acorn Squash with Ling Ling Fried Rice. My family hadn’t tried either acorn squash or Ling Ling Fried Rice when I made it, but they trust my cooking instincts and were rewarded. It was delicious! If you haven’t tried the Ling Ling Frozen Fried Rice line yet, that’s probably because it’s brand new! Look for it in the freezer section of Walmart. That’s where I found it, so I know they carry it. There are five authentic, craveable Asian-style fried rice dishes inspired by recipes from Japan, China, Korea and Thailand: Yakitori Chicken, Yakiniku Beef, Thai-Style Chicken, Chinese-Style Vegetable and Bibimbap Beef, and you’d be hard pressed to taste a difference between Ling Ling Fried Rice and your favorite restaurant version. Ling Ling uses an Infusion Cooking Method so that each grain of rice is infused with their signature sauces for exceptional flavor and taste in every bite. It’s so good that it makes staying in taste like going out, and we all know there’s nothing like being at home. For this recipe, I chose the Chinese-Style Vegetable variety, and it was perfect with acorn squash (although I totally snuck a spoonful or two before I stuffed the squash). It’s irresistible. 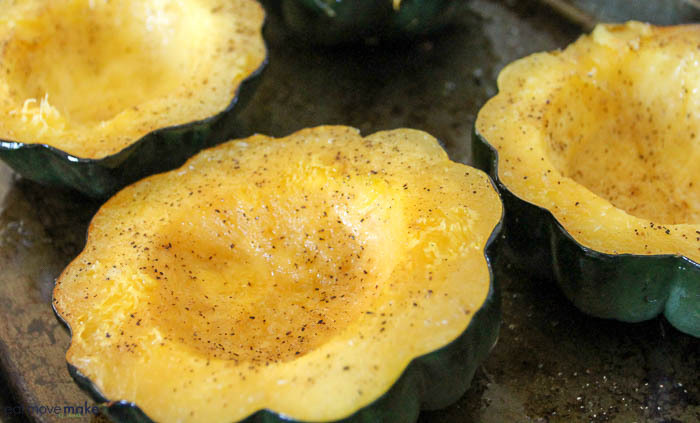 Place squash in a rimmed baking pan, cut side down. Bake for 30 minutes. Squash should be tender. Turn cut side up; dot with butter and season with salt, pepper and garlic. Bake an additional 15 minutes. Remove squash from oven and baste with Szechuan sauce. Fill with cooked Ling Ling Fried Rice. Bake another 5 minutes. The most difficult part of the recipe (and when I say difficult, I’m lying, because it’s easy) is to bake the acorn squash. Cut two acorn squash in half, scoop out the seeds and brush with a little olive oil. Place them cut side down on a rimmed baking sheet and bake for a half hour. Remove from oven and flip them over for a bit of seasoning (salt, pepper, butter, and garlic) before baking a little bit longer. Brush the squash with a little Szechuan sauce for a kick of spice. Then generously spoon the prepared fried rice into the center. You want it heaping, believe me! Bake for another 5 minutes, and then it’s dinnertime! 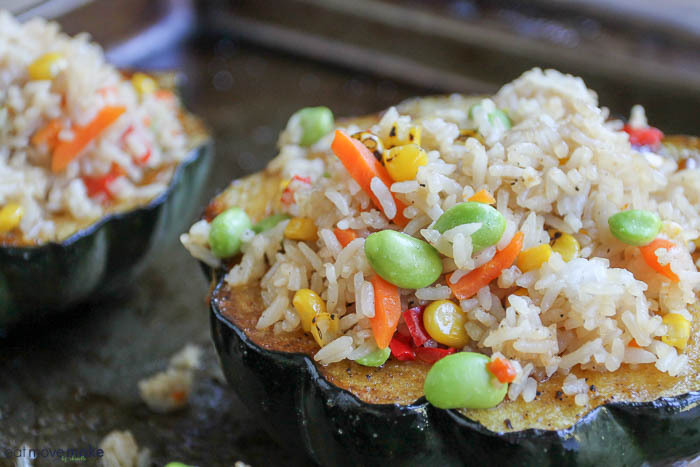 I hope you enjoy the Baked Acorn Squash with Ling Ling Fried Rice recipe as much as we do. Use this coupon for $2 off one box of Ling Ling Fried Rice (there are 2 pouches inside)! My husband eats a TON of acorn squash! It’s SO good! This dish looks delish, too! My kids would absolutely love this! They are all about rice right now and beg me to make it different ways! Ohhhh… this looks so delicious! What a great meal and I love how simple it is. 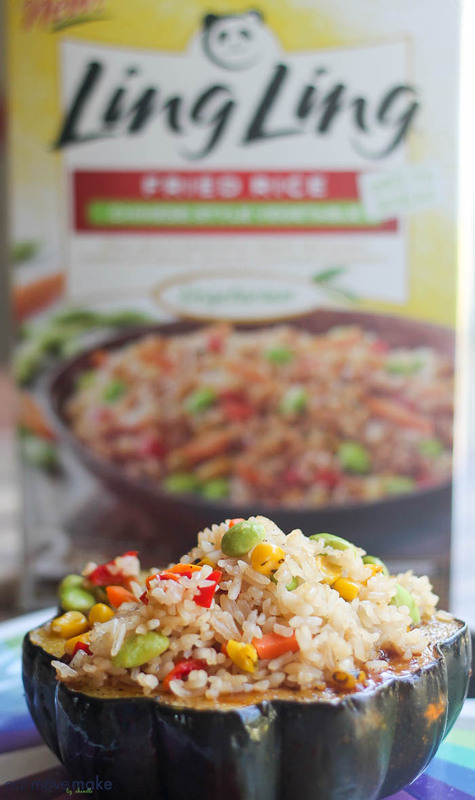 This is a fantastic recipe using our Fried Rice Entrées. 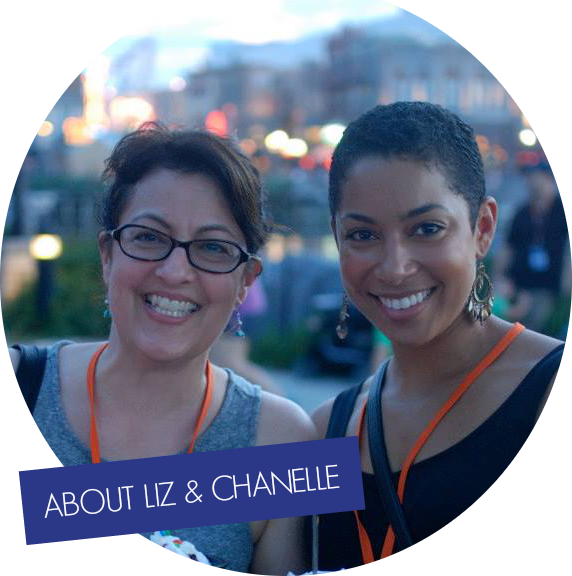 Thanks, Liz and Chanelle! Cooking with squash is the best for this time of year! This sounds so good – a great fall recipe! Yum! Oh wow. Not only does that look incredible but it really sounds like it would be a huge hit in my house! I’ve never had anything like this before. Must try! I really like baked/roasted acorn squash-it’s so good! I’ve never thought of putting Fried Rice in it though, that sounds tasty. What a great fall recipe. I would love to make this some time – I don’t cook much squash, so it is nice to be able to mix up our routine a little. You could swap out with green peppers too! I’ve never had acorn squash before. But I do love fried rice so I may give this recipe a try. I really like that this recipe is super easy and quick to prepare! My husband and daughter love fried rice, so I’m sure they would love this recipe too! I haven’t heard of Ling Ling Rice before but it sounds good. I do believe hubby would enjoy trying this meal. Oh man this fried rice looks amazing! I need to try this new (to me) recipe!! This looks amazingly delicious! I would love to try this soon! Ooh I have to try this! I was surprised the first time I had anything with squash how much I liked it. This sounds perfect for fall! These look so amazing! I think this would be such a great hit for dinner time at our house. Yum! We will have to give this a try this week. I love the presentation for this one as it looks really creative. The fried rice does look really tasty and can make a good meal. I always get so excited for fall because of the acorn squash bounty that hits the shelves. I’ll eat a whole one for lunch. I love the addition of the Ling Ling fried rice. I’ll have to try that asap! I am in love with acorn squash. Have been ever since I tried it many years back. This sounds like a delicious way to eat it! What a great recipe idea. I love how easy it is to make and it sounds yummy. A delicious meal for the family. I would love to try there different fried rice meals. Perfect lunch meal for 5 days of the week. This recipe is healthy and tasty! I can’t wait to give it a try and also check out the other flavors of Ling Ling fried rice, they have so many tasty ones! I love the different kinds of pumpkins available this season and it would be nice to take advantage of all of them while they’re here! I think this recipe is a must try! This looks so good! I am used to eating rice and it would be nice to try all of those yummy flavors out from Ling Ling! The squash is an awesome addition as well. Thanks for this brilliant recipe! I eat a lot of rice too. I haven’t tried Ling Ling but I plan to do so soon. I am always looking for new ways to serve up squash. My son would especially love the addition of the rice! I always see acorn squash and never know what to do with it. This sounds delicious! 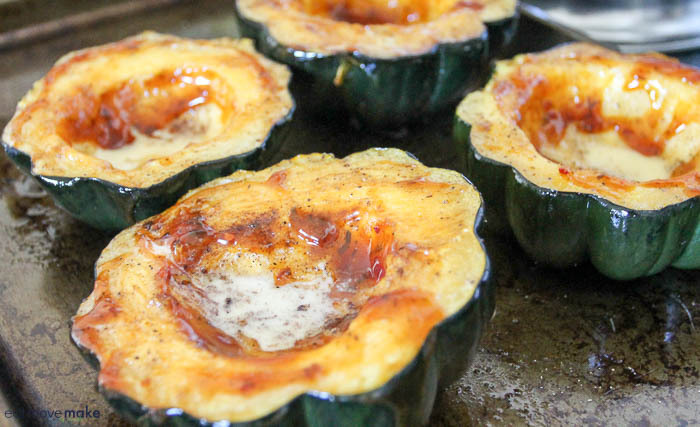 Confession – I have never had baked acorn squash before. I honestly haven’t had much of any squash in my lifetime. This recipe makes me want to try it though! 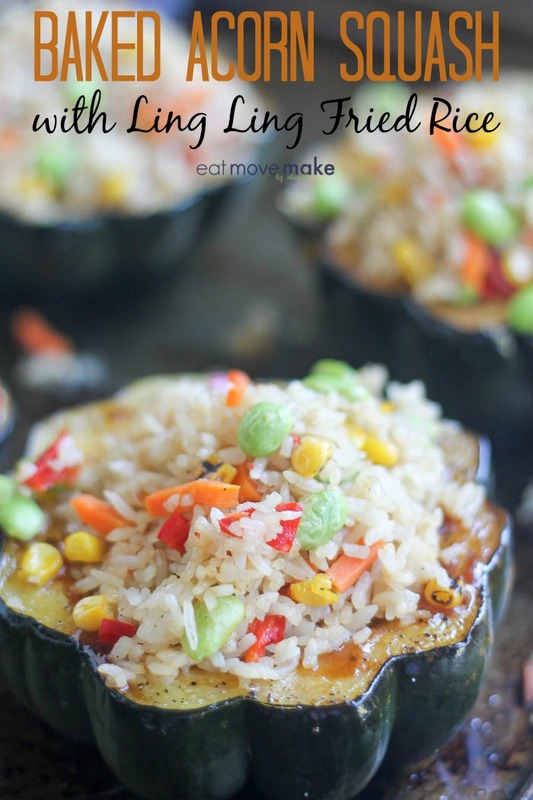 Oh this is an awesome idea, I love the thought to put the fried rice in the squash I definitely need to give this a try myself. I’ve baked acorn squash hundreds of times before but never stuffed it with rice. This look really tasty and a great way to add some protein to an already healthy dish. We love acorn stuffed squash. This is the perfect fall dish and it is so fresh and delicious tasting. Perfect side dish. I love this recipe. I never thought of putting rice inside an acorn squash. What a clever recipe. This sounds delicious and eays to make. Oh my – this dish looks and sounds amazing! Plus, Baked Acorn Squash is one of my family’s favorites. I’ll have to try this out! I love squash! This recipe sounds so perfect for this time of year! Plus the photos are amazing! Yum, this looks fabulous! I must try this out. I enjoy squash and the fried rice looks delicious. This looks so good! I love how you decorated it! Awesome! I LOVE LOVE LOVE acorn squash but it seems Thanksgiving is the only time that I get the chance to make it! This recipe looks great and I can’t wait to add it to the menu! I’m not sure I could get the kids to go for this dish but I love it! I want to try making it for lunch one day next week. This is the perfect fall dish! I know even my girls will love it! What a yummy fall dish! I am so going to try making this one at home! This is so funny, but I had the Ling Ling Beef Fried Rice for dinner. I am obsessed with their food! My mom has a ton of squash and trying to figure out ways to make it, will share this with her for an idea. This looks amazing! I actually really love squash too. I love how you made this. I will have to give it a try soon. Oh my goodness! This looks delicious and is so October! I already added the ingredients to my shopping list and pinned your recipe! I just recently tried acorn squash for the first time. I love it! This is a brilliant idea as I love my squash most in rice. This recipe is sure to be a big hit in my house. I will have to get all the ingredients I need to make some this weekend. I think this is such a yummy fall meal. I would love to recreate it for my family. I have seen this rice in the stores and it looks so good! 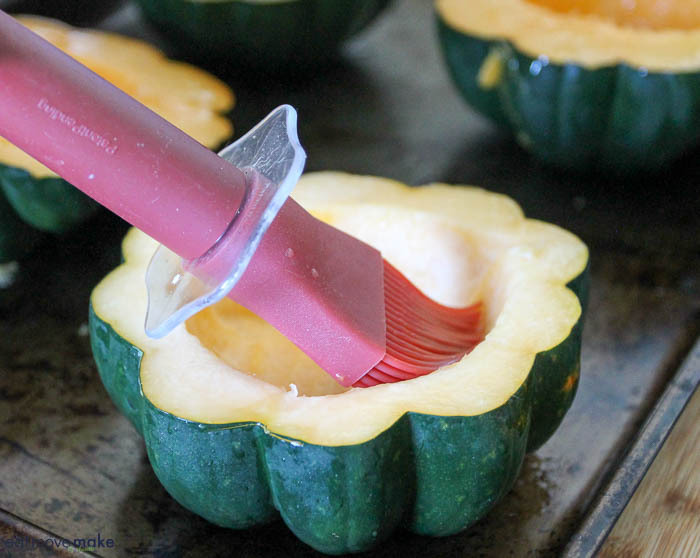 Great idea to use it in the acorn squash! I love acorn squash. What a perfect and beautiful fall dish. This seems like a perfect Fall dish for the whole family to enjoy. We like fried rice so I’m sure this will make a great flavor combo with the acorn squash. That looks really good. I love acorn squash when the weather starts to turn. It’s got a great flavor, and it just feels like fall to me. I have never eaten acorn squash, but dang this looks delicious! I might have to try this recipe and grab some Ling Ling! That sure does look pretty and it looks like it is outstanding. I will definitely go to Walmart and see if I can find that fried rice because I’m craving it now. That looks really good! I love how healthy this is, and it’s the perfect dish for those cool fall and cold winter days. Om nom nom. We’ve been making a real effort to eat healthier in our house and this recipe is right up our alley! Oh man, this sounds SO good. What a delicious fall meal idea. I might actually make these for Thanksgiving.